The arrival of the Philadelphia militiamen turned the relatively peaceful strike in Pittsburgh into a scene of violence and disorder. Pennsylvania Railroad officials attempted to resume freight traffic and ordered the troops to suppress any resistance. On the afternoon of July 21, many of the striking workers and their families threw stones and other missiles at the troops. The Philadelphia “Dark Blues” opened fire, killing over twenty people, including one woman and three small children. The crowd dispersed, but as word of the bloodshed spread throughout the city, the strikers gained sympathy. The strikers regrouped and returned to the streets, this time with hundreds of residents and fellow workmen at their side. Meanwhile, the Philadelphia Militia had taken refuge in one of the railroad company’s roundhouses–a large round structure used to house and service locomotives. The crowd, which continued to grow larger, attempted to burn the soldiers out, setting oil cars alight and rolling them down the tracks toward the roundhouse. Although the soldiers managed to keep the flames under control, they remained trapped in the building until 7 the following morning. 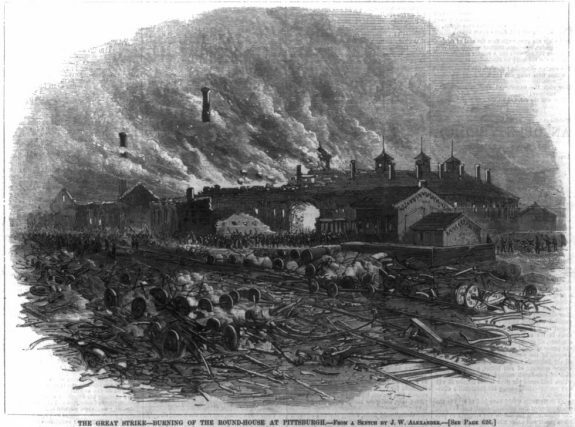 This illustration, depicting flames and thick smoke rising from the roundhouse, was published in the August 11, 1877, issue of Harper’s Weekly. The first nationwide strike in the United States occurred in the summer of 1877 as rail workers and their supporters throughout the nation protested conditions under corporate control. While Philadelphia largely escaped the turmoil that erupted in other cities as authorities worked vigorously to quash labor opposition, the city’s National Guard regiment nonetheless became entangled at the center of Pittsburgh’s violent confrontations. 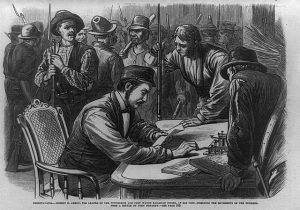 The leading causes of this strike lay in the Panic of 1873, which brought massive unemployment, exposed the lack of safeguards against unemployment and support for relief for the poor, and brought attention to the concentration of power in corporate hands. When workers were presented with a 10 percent wage reduction in June and July 1877 on top of those horrible conditions, they struck. Starting on July 16, the Great Railroad Strike of 1877 began in Martinsburg, West Virginia, spread quickly throughout the nation, and reached Pennsylvania on July 19. That morning workers in Pittsburgh struck against reduced wages and the institution of “doubleheading,” the practice of doubling the number of rail cars without increasing work staff. The morning of July 19 two brakemen and one flagman refused to go on a doubleheader. Throughout the day workers refused to couple train cars, seized switches, and swarmed the tracks, preventing any freight trains from leaving the city. The company appealed to the mayor and sheriff for assistance, but both proved ineffective at dispersing the strikers. The local regiment of the National Guard mustered into duty on the morning of July 20, but only 250 of the 326 men reported for duty. Lacking sufficient force to meet the emergency, adjutant general and Philadelphia native James Latta (1839–1922) telegraphed Major General Robert M. Brinton (1843-85), commander of the First Division of the National Guard in Philadelphia, for assistance. The next day, six hundred Philadelphia militiamen left for Pittsburgh. The arrival of the Philadelphia militiamen turned the relatively peaceful strike in Pittsburgh into a scene of violence and disorder. Pennsylvania Railroad officials attempted to resume freight traffic and ordered the troops to suppress any resistance. When protesters threw stones and other missiles at troops, the Philadelphia “Dark Blues” opened fire, killing over twenty people, including one woman and three small children. 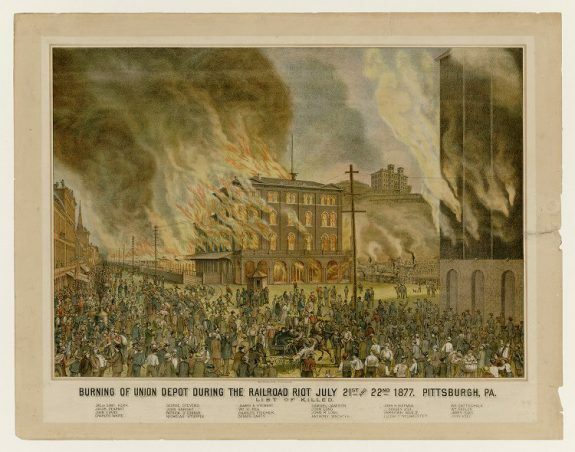 The outraged strikers and their sympathizers spent the rest of July 21 burning all the Pennsylvania Railroad property they could. The following day, troops clashed again with protesters, leaving an additional twenty-three dead, including three members of the First Division. The Philadelphia troops ultimately escaped the city and returned to Philadelphia, but their presence and actions in Pittsburgh drew significant criticism from a subsequent investigation. By way of contrast, the city of Philadelphia served as a model of law and order during the Great Railroad Strike. Alerted to the trouble in Pittsburgh, Thomas A. Scott (1823–81), president of the Pennsylvania Railroad, enlisted the help of Philadelphia Mayor William Stokley (1823 – 1902). Known both for personally leading troops against striking gas workers in 1872 and keeping Philadelphia safe during the Centennial celebration of 1876, Stokley responded quickly with the concentration of his 1,300-man police force in the vicinity of the West Philadelphia station, located one block from the present 30th Street Station. Responding to the reported violence in Pittsburgh, Stokley banned public meetings and suspended the citizens’ rights of assembly. On Sunday July 22 a crowd of nearly five hundred people approached the West Philadelphia depot. As the Philadelphia troops had done in Pittsburgh, the Philadelphia police charged the crowd, but with nightsticks instead of bayonets. This show of force, and lack of fatalities, dispersed the crowd and restored order to city. Shaken by the incident, however, Scott wired Governor John F. Hartranft (1830-89) for additional troops, which arrived the following day. Together with an augmented local force, doubled in size once again by Stokley, these forces assured that freight trains would successfully leave the city on July 24. 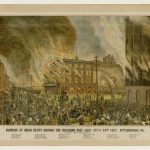 A number of factors saved Philadelphia from the fate of Pittsburgh and the handful of other cities where violence followed the strike. Unlike Pittsburgh, where the Pennsylvania Railroad drew widespread criticism for charging exorbitant rates, Philadelphia’s leadership maintained a favorable attitude towards the corporation. The city itself held 59,000 shares of Pennsylvania Railroad stock, worth nearly three million dollars and therefore had a vested interest in preventing destruction of its property. More important, the combination of Stokley’s quick actions and the city’s show of force spared Philadelphia. While Pittsburgh Mayor William McCarthy (1820–1900) refused to appear before the crowd in his city, and ultimately left the city to care for his sick wife, Stokley returned from vacation and personally oversaw the efforts to prevent large-scale unrest. Stokley’s decision to increase the police force of Philadelphia to 1,300 men before the strike, and then to double that number as unrest unfolded, gave Philadelphia nearly twenty times the local forces than was available in Pittsburgh during the strike (a meager 120 men). The only fatality in the city during the nation’s great labor uprising occurred on July 26, as policemen attempted to break up a public meeting. Although criticized by labor advocates and defenders of civil liberties, Stokley received praise for his actions not only from Philadelphia newspapers, but also from the committee formed to investigate the strike and by Governor Hartranft in his 1878 annual address to the state. By the end of August, the Great Railroad Strike had ended throughout the nation, primarily due to the increased presence of federal troops. Questions followed about the role, function, and efficiency of law enforcement agencies throughout Pennsylvania during the strike, including that of the National Guard. Ultimately, while Philadelphia’s First Division received harsh criticism for its actions in Pittsburgh, Stokley set an example for the state and nation on how best to combat civilian unrest. Bruce, Robert V. 1877: Year of Violence. Chicago: Elephant Paperback, 1989.
Cooper, Jerry. 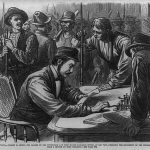 “The Army and Civil Disorder: Federal Military Intervention in American Labor Disputes, 1877–1900.” Ph.D. diss., University of Wisconsin, 1971. Foner, Philip S. The Great Labor Uprising of 1877. New York: Monad Press, 1977. Kuritz, Hyman. “The Pennsylvania State Government and Labor Controls from 1865 to 1922.” Ph.D. diss., Columbia University, 1954. Mackey, Philip. 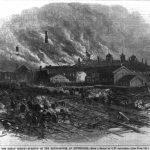 “Law and Order, 1877: Philadelphia’s Response to the Railroad Riots.” The Pennsylvania Magazine of History and Biography, Vol. 96, No. 2 (Apr., 1972): 183–202. Stowell, David O, ed. The Great Strikes of 1877. Chicago: University of Illinois Press, 2008. Report of the Committee Appointed to Investigate the Railroad Riots in July, 1877, Joseph P. Horner Memorial Library, German Society of Pennsylvania, 611 Spring Garden Street, Philadelphia. William S. Stokley Grave, Laurel Hill Cemetery, 3822 Ridge Avenue, Philadelphia. Railroad Strike of 1877 Historical Marker, 28th St. Crossing off Liberty Avenue, Pittsburgh, Pa.
John F. Hartranft Historical Marker, Sanatoga Road, SW of Fagleysville, Pa.